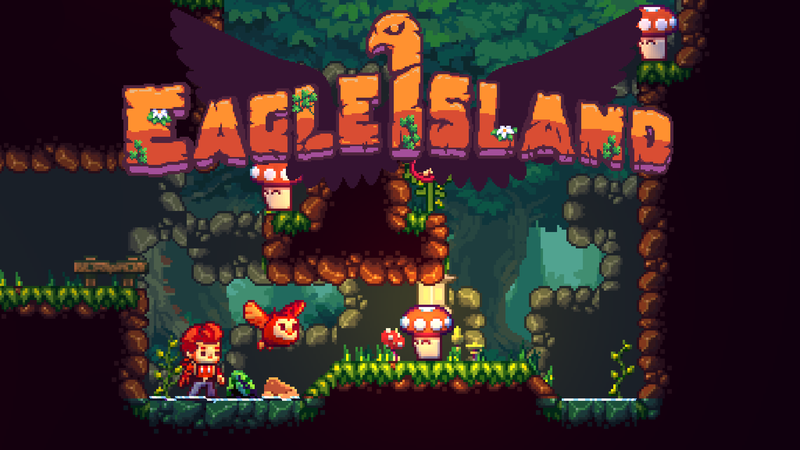 With unique gameplay set to a beautifully modernised pixel art aesthetic, Eagle Island provides a breath of fresh air to the platforming genre. Quill controls with old school platforming charm. There's no new fangled double jumping or wall jumping here. The gameplay ramps up when Quill receives an old falconry glove. Launch Koji from his hand to defeat enemies that stand in his way. When the going gets tough, use the feathers granted to you by the legendary Totems and transform Koji into his most powerful forms. Quill's falconry glove contains an expandable selection of perk slots. Collectable seeds can be exchanged for perk tokens which can be inserted and removed from the glove. Create a mixed collection of effects for Koji! Beneath it's cute exterior, Eagle Island boasts a combo system which it's essential to master before taking on the more challenging stages. Quickly switch Koji into his most effective forms whilst defeating enemies in increasingly quick succession. Exploring the island overworld, Quill can find the entrances to 9 procedurally generated levels. Each level is carved out uniquely, you'll never happen upon the same area twice. Environments range from open spaces to tight caverns and man made structures. Secret areas can be discovered by destroying weak walls or finding secret passages. In the depths of each level, confront the boss and prove your mastery of the duo's latest power up! It's vital to collect the most powerful perks before the showdown. Delving deeper into the island's past reveals layers of history and lore to satisfy the most curious of minds. Find the download link on pixelnicks.itch.io/eagle-island! Eagle Island launches Kickstarter campaign! Pixelnicks has launched a Kickstarter campaign to fund the development of Eagle Island. Pixelnicks launches Eagle Island on Greenlight and releases trailer.